One of the most powerful tools you can use to reach your feel great weight and your dream time on the finish line is hidden in plain sight: It’s on the nutrition label of your favorite packaged foods. Studies have shown that people who read food labels are more likely to lose weight than those who don’t. 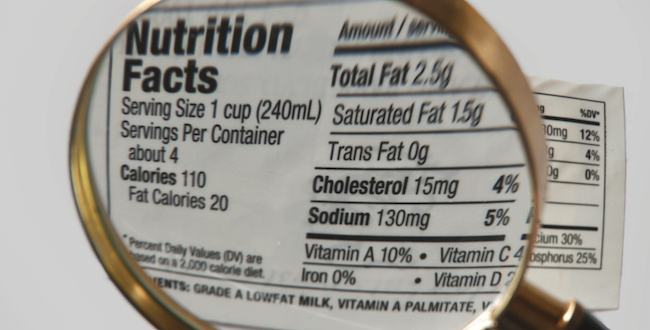 And many dieters and runners find that reading food labels is both surprising and humbling. They’re often shocked to find out how many calories a small snack they might not have thought about actually contains, or to realize that they’re consuming half a day’s worth of calories in the car on the way home from work. There’s plenty of evidence that when left to our own devices, we vastly underestimate calorie counts. When you’re examining the Nutrition Facts panel and ingredient list on your favorite foods, here’s your 12-step guide to what you should look for to lose weight and get faster. Many serving sizes are much smaller than what people are accustomed to eating. To stay on track, you may want to break out your measuring cups, spoons, and kitchen scale. Some foods that look like a single serving are actually two servings or even more. Assess this in terms of your daily calorie targets. If your daily calorie target is 1,600 and that smoothie has 600 calories, you’ll need to figure out how to cut back in other places. Avoid them altogether. In November 2013, the FDA took them out of the “generally recognized as safe” category. The Institute of Medicine has concluded that trans fat provides no known health benefit and that there’s no safe level of consumption of artificial trans fat. Eating foods that contain saturated fats raises the level of cholesterol in your blood. High levels of saturated fat increase your risk of heart disease and stroke. So keep your intake as low as possible. The American Heart Association recommends no more than 5 to 6 percent of your daily calories from saturated fat. So if you aim for 1,600 calories a day, you shouldn’t consume more than 9 to 11 grams of saturated fat per day. Aim as low as possible, no more than 10 grams of sugar per serving. To keep your energy levels stable, try to consume this at even intervals throughout the day. If you’re craving an item with more sugar, have it right before a workout, when your body can use it for energy, or within 30 minutes of finishing a tough workout, when your body needs carbs to restock your glycogen stores so you can bounce back for your next workout. And if you’re eating raw fruit or a dairy product, don’t stress about sugars. Aim for as high as possible, while still maintaining your calorie target for your meal or snack. Protein helps repair and rebuild torn muscle tissue so you can bounce back strong for your next workout. And it promotes a feeling of fullness, so you won’t feel hungry. That’s why it’s important to spread protein intake evenly throughout the day. But watch out for some seemingly healthy, “high-protein” foods. Some items, such as high-protein bars, may have a meal’s worth of protein, but they also have a meal’s worth of calories, at 300 to 400 calories per bar. There are better choices out there. Related - Eating More Fiber Foods Could Aid Your Weight Loss Goals. Like protein, fiber makes you feel full. It also keeps your GI tract healthy and, because it can reduce your cholesterol levels, fiber promotes heart health. Men should aim for 38 grams of fiber per day and women should target 25 grams of fiber per day. So aim as high as possible with fiber. But to avoid GI distress on the run, your preworkout snack or meal should have less than 7 grams of fiber per serving.